All three members of Piaclava are passionate about exploring music with both kids and adults alike. For many years, they have been leading educators both in the private studio and in the classroom for organizations such as Lincoln Center Education, the Rocky Ridge Music Center, the ASTA Chamber Music Institute, and the Wellesley Composers Conference. 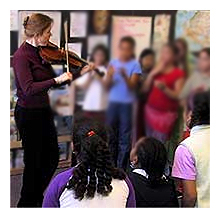 In addition to her teaching artist workshops, Jessica has also scripted many outreach concerts for the Hudson Valley Philharmonic and for counter)induction. Whether it’s how the sounds of the instruments remind us of a memory from long ago, or how a song can connect to a specific life experience – music is one of the purest forms of communication and has the power to evoke some of the deepest emotional responses. This is one of the reasons why the members of Piaclava have chosen to become musicians in the first place. Piaclava offers inspiring interactive concerts that are tailored to every audience, especially for those who are not able to attend performances often.